Heard about the Hot Wheels Color Shifters Road Trip ? Shifter cars with a full size 2010 Ford Mustang. This cool white Mustang changes from white to blue when it's thermactic color memory paint is exposed to cold or warm water. The company kicked off a tour across Canada, running from Ontario, across the country, all the way to British Columbia (Vancouver Olympics) and back again, stopping at kids camps and local events. Kids got a chance to splash water on the car and change it's colors before their eyes. 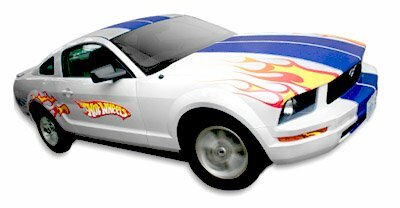 And to make the Hot Wheels Colour Shifters Road Trip even more memorable for the kids, they received Hot Wheels collector booklets, a T-shirt and more. Kind of makes you want to go out and get some of that paint for your own Mustang. Out here in the land of sun and rain, I could have a different car every day! Still looking? Use the search box to find information quickly.